As one of the founding places of American Sinology, Columbia’s study of the history and culture of China has been admired for both its breadth and depth. The program’s disciplinary strengths range across institutional and legal history, social and cultural history, economic history, as well as the history of philosophy, intellectual thought, and religion, augmented further by research in gender, family, material culture, technology, and the practice of field archaeology. The program’s strengths lie in all major periods of Chinese history, with particular emphasis on Early China, the Five Dynasties-Song, late imperial and the modern periods. The foundation for Columbia’s study of Chinese history and culture is rigorous language training in modern Chinese, classical Chinese (which teaches a wide range of texts from pre-Qin philosophy to Ming-Qing literature), and related languages including Japanese, Korean, and Tibetan, available in the department, and relevant European languages elsewhere on campus. We offer two Chinese bibliography and documents courses, with one focused on traditional textual scholarship and the other on Qing and twentieth-century documents. In addition to deep training in Chinese history, culture, and language, the program provides engagement with critical methods, comparative perspectives, as well as transnational and global analyses. 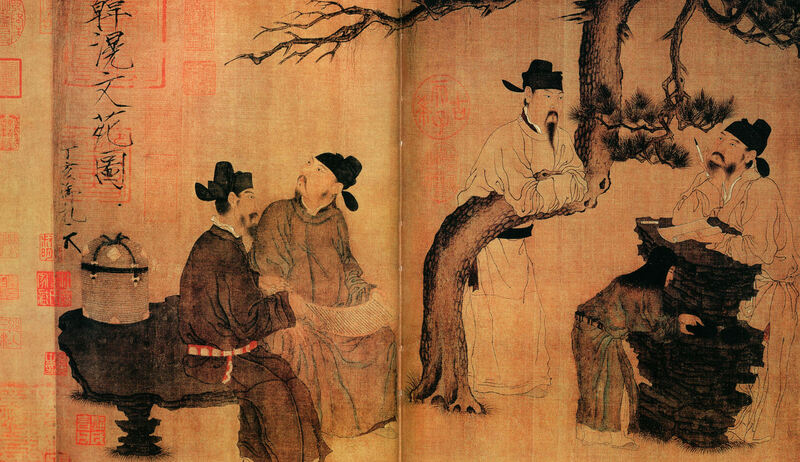 Professors Li Feng and Guo Jue are the primary scholars of the Early China period. Building on the legacy of early scholars at Columbia such as Burton Watson and Hans Bielenstein, Li Feng offers both introductory courses and graduate seminars in early Chinese history and archaeology. He conducts research and advises students in bronzes and inscriptions, paleography, Western Zhou history, Bronze-Age archaeology. He also trains students in archaeological fieldwork. Guo Jue teaches courses mainly on Warring States-Han manuscripts and tomb archaeology, the history of early Chinese philosophy and religion, as well as the history of everyday life. While placing the newly excavated inscriptions and manuscript texts at the center of our research and teaching, the program encourages studies that critically explore the value of all types of evidence to answer questions of cross-regional or cross-cultural importance. The Tang Center for Early China, located in the departments, provides a critical venue for discussion of Early China scholarship in the region. PhD students of Early China can pursue dissertation research on a wide range of topics in any subperiod from Shang to Han along either the history track or archaeology track. The archaeology track involves substantial work with Columbia’s anthropologists and archaeologists of other world regions. The programs sees archaeology as a discipline with a broad scope and diverse practices adapting to regional natural and cultural perimeters, a discipline that is integrally related to and complementary with both the study of history (as both are ways to understand the human past), and with anthropology (as both are ways to understand patterns of human behavior). Columbia’s program in Chinese archaeology has grown together with the Guicheng archeological survey and excavation project, jointly conducted with the Institute of Archaeology of the Chinese Academy of Social Sciences (Beijing), and the Shandong Provincial Institute of Archaeology in 2006-2011. The archaeology track operates in close connection to Columbia’s Department of Anthropology, the Department of Art History and Archaeology, and the Columbia Center for Archaeology. MA students of Chinese archaeology are encouraged to take theoretical and methodological courses in anthropology. PhD students are expected for more substantial work with Columbia’s anthropologists and archaeologists of other World regions. “Gathering of the literati” (Wenyuan tu), believed to have been a work by Zhou Wengui of the Five Dynasties period, 907-960. The middle period has been a long-standing strength at Columbia. Wm. Theodore de Bary made the department a worldwide center for the study of the Neo-Confucianism of the Song through the Ming, and David Johnson established our strength in the social history of the Tang and pre-Tang great clans and their replacement by the new elites of the Song. Robert Hymes works in the social and cultural history primarily of the Song and Yuan with a particular focus in the history of elites, their cultural self-definition and their relation to the state, the history of medicine, and religious Daoism and its relation to lay religion. Currently he is working on the problem of “believing” (xin) in both secular and religious contexts in the Song, and on bubonic plague in the Jin-Yuan and Yuan-Ming transitions and its relation to the European “Black Death” of the fourteenth century. He advises PhD dissertations on a wide range of topics from Tang to early Ming. The middle period and the study of the early-modern and late-imperial periods are closely collaborative at Columbia. Dorothy Ko is the primary scholar of late imperial China at Columbia. Dorothy Ko’s research and teaching focus on the sixteenth to eighteenth centuries, from the mid-Ming to mid-Qing. Her earlier research centered on gender and women’s writings, whereas her current research concerns artisanal knowledge and technology. She is particularly interested in guiding students who work, as she does, on the interstices of cultural history, art history, and the history of science. Depending on their topic, students will also receive guidance from specialists in literature, religion, or art and material culture of the period. Professors Eugenia Lean and Madeleine Zelin teach and advise in modern and contemporary Chinese history, vibrant fields of history at Columbia. Madeleine Zelin, who earlier studied the fiscal and political history of the early Qing, has more recently been conducting research on the legal, economic and institutional histories of China from the eighteenth to twentieth centuries. Her courses cover subjects as diverse as the relationship between law, culture and society, global industrial revolutions, state-building in China’s long twentieth century and merchant and business practices. She also guides students who study China’s frontier regions. Eugenia Lean teaches and writes about the late nineteenth and twentieth centuries. Her earlier work focuses on cultural and legal history, media culture, gender and the history of emotions in modern China. Her current research has turned to the history of science and technology, the cultural history of industrialization and mass production, as well as intellectual property and questions of ownership in law and culture. She teaches broadly covering a wide range of topics in modern Chinese history. Both advise students in a diverse range of fields including those interested in global and transnational history related to modern Chinese history. The East Asian community on campus offers a variety of programs related to Chinese history. The department’s Pre-modern China lecture series brings in up to eight guest speakers a year. The Weatherhead East Asian Institute has a range of talks, events, and programs focusing on early modern, modern and contemporary China, along with diverse offerings in Japanese, Korean and Tibetan studies. The Institute also runs the Modern China Seminar, a forum for modern China scholars from the tri-state area to share scholarship. The Confucius Institute sponsors large-scale workshops and conferences on Chinese history and culture. All historians in EALAC are affiliated with Columbia’s History Department and our graduate students in Chinese history are admitted either through EALAC or History, have access to the courses and resources of both departments, and are expected to fulfill shared requirements as stipulated by the joint History-East Asia Program that bridges the two. With the C.V. Starr East Asian Library, Columbia University has one of the richest library collections in the world for Chinese history. It has very extensive holdings on paleographic materials as well as archaeological publications. Reference works including various traditional and modern encyclopedias and local gazetteers are other areas of the library’s strength. Its modern collection is particularly notable for significant digital databases and electronic resources, including an electronic version of the early twentieth-century journal, Ling Lung, and a searchable database for wenshi ziliao, and for a growing collection of modern Chinese film and ephemera such as posters and advertisements. The Starr and other Columbia libraries own a large number of oracle-bones, bronze vessels, as well as stone pictorial carvings, steles, and sculptures readily accessible to faculty and students for teaching and research. The Rare Book and Manuscript Library houses 5000 pages of Peter and Edith Chang’s papers dating from 1930s to 2001, together with manuscript pages from Chang’s interviews. The PhD students in the program come from all over the world and are noted for their diversity of interests and expertise. The PhD program provides full funding (covering both tuition and stipend) for five years, as well as five summers of research support. Additional opportunities for graduate student funding are available on campus, including from the Weatherhead East Asian Institute. The thriving MA program has trained many students to go on to the PhD programs and to professional careers. Please see the list of recent graduates and their dissertation topics as well as the current PhD student profiles. Please feel free to contact the faculty by email (list on the faculty profiles) to find out more about the program.